Music and art combine in our second custom series range. Unique and exclusive to Jaxville we are proud to present three highly original deigns on three beautifully crafted guitars. From the darkest caverns of Hades, to the summit of mount Olympus these distinctly original designs are beautifully grafted onto the body of our most popular guitars. Exclusively commissioned by Jaxville these designs embody our ethos for uniqueness, style and class. When it comes to distinctive guitars we feel the Custom Series 2 has exceeded expectations of what a designer guitar can be. 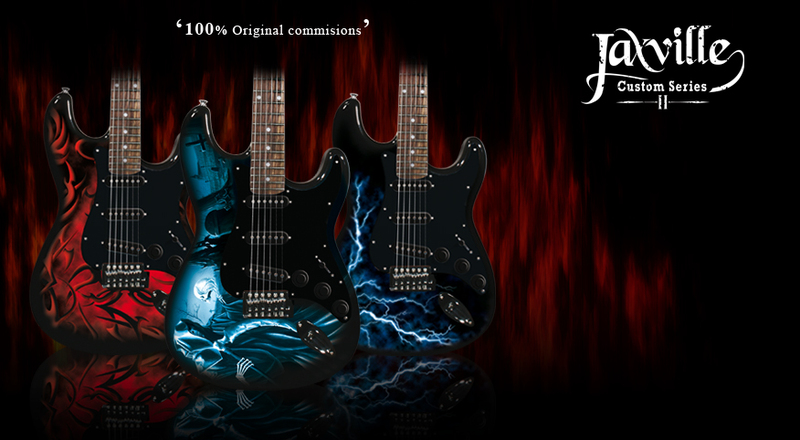 These exquisite pieces of artwork capture the darker side of rock completely and look perfectly placed on the high black finish of these exceptional guitars.